And play the game where losing is actually winning and your character may be the dumbest person to ever live! After waking from a terrifying dream of your own untimely death, you attempt to make your way to the Finnigan Brothers' Fun Park for its last day then back home again in this all new text-adventure from CoaguCo Industries. You must survive 10 pages of ridiculous deaths and traps spanning over 157 ways to die with no discernible way to navigate to safety. It's like playing Russian roulette with five chambers loaded, but more frustrating. Warning, this game is mostly reading. Lots and lots of reading. We’re still gearing up with a large content update / overhaul that will make many significant changes to the game as and add in some new stuff for everyone. There is a planned announcement with specifics coming at the end of February so stay tuned! Hey, death-seekers! 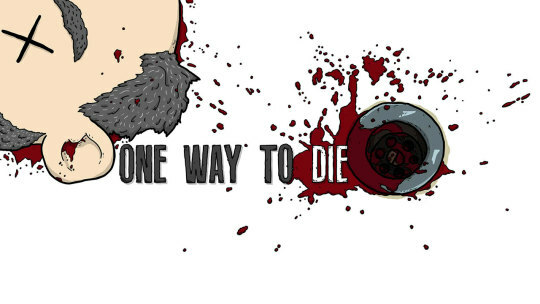 Today we are releasing the version 4.1 update to One Way To Die which mainly focuses on achievement and statistic fixes. And, of course, a bunch of tiny changes to a bunch of other stuff too. Also, we have made some small changes to prepare for a QOL content update that will add a new game mode in. There is no real date as to when it will launch but there will be some significant changes made to the game similar to what we did with the last big update. This is the official change log for One Way To Die: Steam Edition. Added: new menu graphic of "Now With Choose Mode"
Fixed: annoying "helper" messages blocking text, now clickable! Here are all the current ways you can die in the game; 157 in total. Good luck. Asterisk (*) denotes deaths only in Deluxe Edition. Halloween and X-Mas deaths are only available during their respective seasons.